Ingredients: 250 gm paneer (cut into cubes), 2 tbsp maida, 2 tbsp cornflour, 3 tbsp tomato ketchup, 2 tsp chilli sauce, 1 tbsp soya sauce, 1/4 tsp sugar, 1 tsp vinegar 2-3 green chilli (slit), 1 onion (chopped tinily), 4-5 garlic pods (chopped thinly), oil (for frying). 1. Mix together maida , cornflour, salt & pepper. 2. 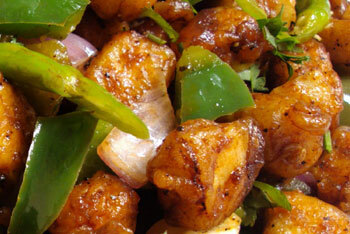 Put paneer cubes pieces in this maida mixture & toss it. 3. fry this in oil till golden brown drain it & keep aside. 5. Mix all other sauce and vinegar. 6. Add salt pepper & sugar and stir it.